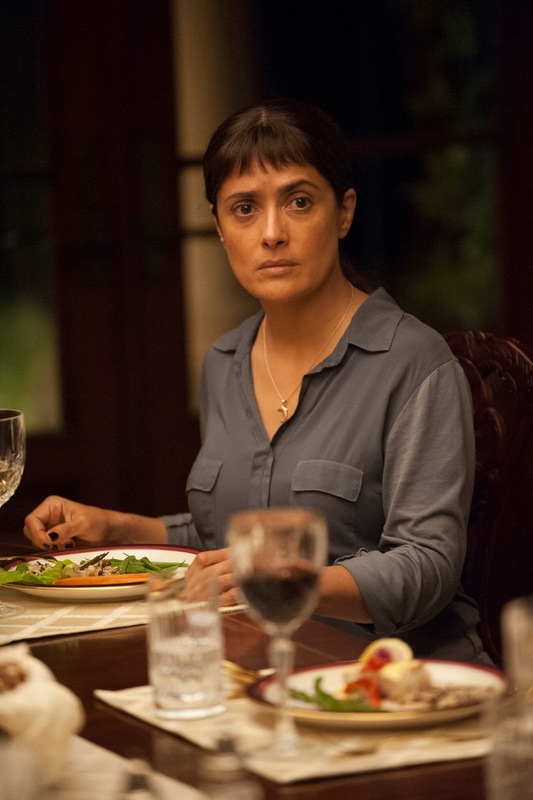 For a film that's supposedly "the first to address Trump-era issues this year," BEATRIZ AT DINNER quickly destroys the very character it aims to present as a social justice warrior, a woman of color who chooses not to sit idly as those around her bask in their own ignorance, to the point where each pointed, forward-thinking liberal rant she utters comes off awkward, terribly so. She's turned into a punchline instead. Despite being directed by a Puerto Rican-American filmmaker (Miguel Arteta, The Good Girl), it becomes painfully clear that the script was written by a white male scribe (Mike White) whose credits include nary a narrative that centers people of color. Let me set this up for you: Salma Hayek plays the title character, a masseuse originally from Mexico whose healing has become the pride and joy of one of her most influential clients, Cathy (Connie Britton), a rich white woman who's hired Beatriz for an in-home treatment in preparation for her husband's corporate dinner party at their home that same evening. However, Beatriz has to stick around after the appointment because she gets stranded there when her car breaks down. Eager to express pity and inclusivity (mostly for bragging rights among her similarly aloof friends), Cathy invites Beatriz to her dinner. 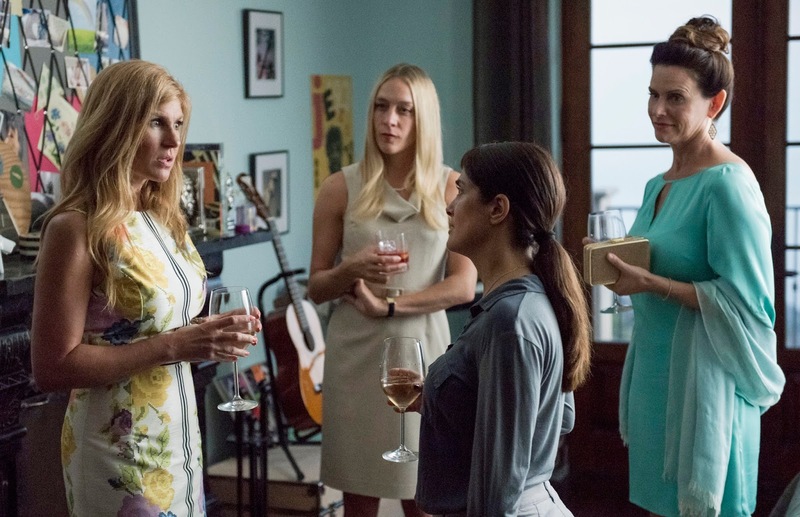 Already, Beatriz is an outsider, someone who was not invited to the party, inappropriately dressed, only brought to this residence to provide a service for Cathy. And even more strikingly, she's the only person of color at the table, the only one of working class. She's not even supposed to be there, and all the guests know it. It is expected that she shut up, eat her catered meal prepared by a Latina and a white gay chef (presumably also placed as intentional props in the film), and be thankful for Cathy's wonderful gesture. Right away, the sea of white faces at the dinner table very noticeably struggle to enjoy their dinner, empty conversation, and libations in the presence of the "immigrant help" sitting among them, silently not being addressed or catered to. But wait, there's more. Beatriz shares a strange story with Cathy in the middle of her massage about how her goat was killed that morning. Yes, a goat, in Southern California. One of several she apparently keeps as pets, unironically. And she's deeply spiritual, in that she not only heals through the power of massage, but she apparently has visions. WHY must she be set up this way? Why couldn't she just be the only person of color at the table but maybe Cathy's friend or a corporate associate of her husband (David Warshofsky)? Or just a regular person with an actual invite to the party, who's responding as anyone would to the offensive and remarkably out-of-touch remarks of her white counterparts? Why oh why does she have to be so outside the box? It taints every clear-minded, valid thing she says to these fools. Because White (or white Hollywood) clearly can't fathom why a person of color with the same economic status would even encounter a situation in which she is compelled to defend her citizenship among the clueless and privileged, or that a person of color would even be among this class. As a result, he makes her a stereotype, a trope that is more easily digested in white America than a three-dimensional character of color. He gives her agency in that the story is driven by her character, except he doesn't really because he neither portrays her genuinely nor thoughtfully. So why even bother with this story at all? What is the point of plopping this character in the middle of a table of white conservatives whose conversations center on successful business ventures, hunting, and the latest reality star scandal? If you're going to make a statement, make the statement. White gets up to the plate, and decides to make her a joke instead. Literally, for no reason at all. 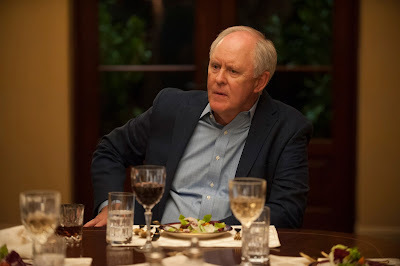 Having Beatriz react in frustration over business titan Doug Strutt's (John Lithgow) corporate ivory tower of self motivation and indifference, after everything we know about her at that point, weakens everything she says because we're made to think that she's kind of a looney tune. And it doesn't help that her retort is more spiritually motivated, propelled by a "feeling" she gets, rather than a visceral reaction to injustice. For the sake of avoiding spoilers, I won't tell you how the movie ended. But it is as frustrating to watch as, well, most other scene in the movie. It's unredeemable and unsatisfying. BEATRIZ AT DINNER could have been a very smart film that addresses some of the social issues brought to the service during this Trump era, but instead it chickened out, at the expense of its own protagonist. What a shame. BEATRIZ AT DINNER is in theaters Friday. I was eager to see this movie. It was totally unsatisfying. I felt that the writer just didn't know what to do with the character at the end. Yes, why even bother with the story at all. Daaaamn I was thinking about seeing this movie this weekend. Probably best to pass, huh? Thanks for the review! completely agree and that ending? I think White developed a case of writer's block and had no idea jow to resolve the entire mess.